When students engage in work for real-world audiences they learn on a deeper, more connected level. From 6th to 8th grade, we provide opportunities for students to value their work and connect that work to the world around them. This type of authentic problem solving is part of the fabric of how we teach at Severn. 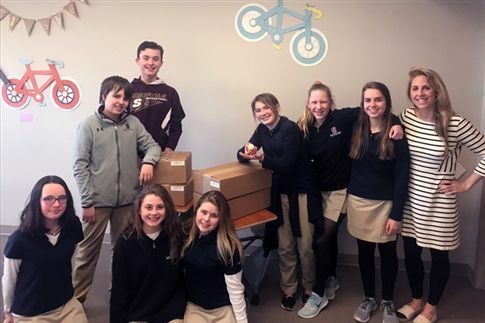 Click below to read more about authentic learning in the Middle School. The 8th Grade Showcase highlights our students’ individual strengths and talents on the eve of the 8th grade promotion. Faculty, family, and friends come together to celebrate our students’ hard work, creativity, and efforts throughout their middle school careers, especially their 8th grade project-based assignments. Each 8th grader selects products that illustrate their talents, dreams, and accomplishments. A variety of academic and non-academic artifacts are on display including videos, artwork, projects, and live performances. 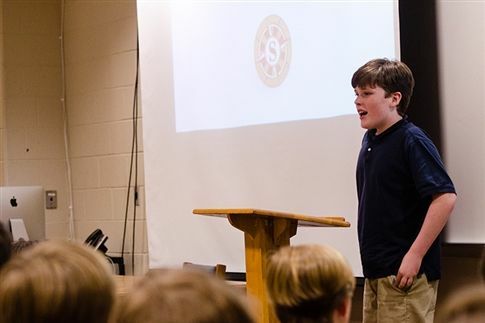 Each 8th grade student delivers a speech that is both personal and research-based. The students advocate for various local, national, and global causes. The speeches themselves are an act of civic responsibility, and students are inspired to draft and polish such speeches by their summer reading, The Boy Who Harnessed the Win, an extraordinary true story conveying that the human spirit, innovation, and advocacy can surpass struggle and hardship. The novel fosters the idea that the essence and power of a single person’s capacity can enhance the community and its people. Secondly, the speeches have proven to shape and establish a greater sense of community membership in the middle school. Delivered during morning meeting, the speeches entail the 7th and 6th grade students to practice listening and civil behavior, as they are the authentic audience for the teaching and learning of well crafted, thoughtful writing and refined speaking. The 8th graders develop a keen voice through community advocacy and build personal confidence in the process. 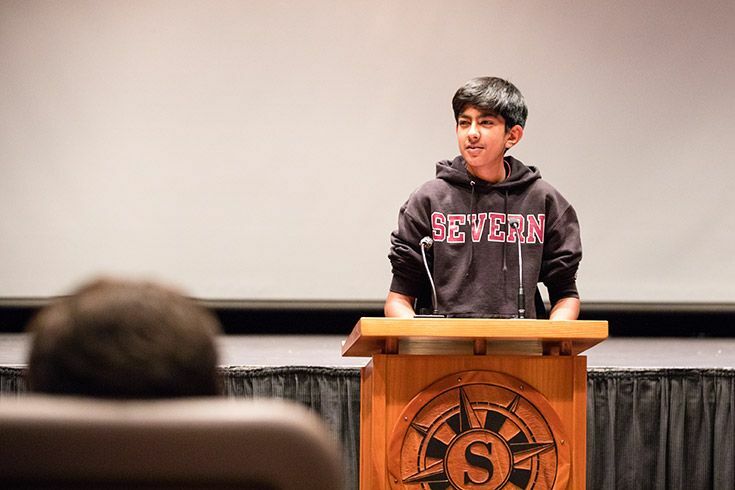 In fact, for a recent advisory reflection, many 8th graders stated the speech was one of their biggest challenges in their middle school experience, yet it was also the most satisfying while experiencing and completing the task of speaking publically in front of the entire middle school community. At the end of their academic year, 6th grade students write and deliver their This I Believe compositions. Modeled after the NPR program, the essays ask students to consider what they value in their lives. The writing assignment also requires students to reflect on their 6th grade English novels. During the writing process of the essay, students continually ask: how do my values connect with the experiences, the challenges, the worldviews of the characters about whom they read throughout the 6th grade year? The essay writing encourages text-to-self connections and calls for deeper reflection with students’ values and sensibilities. Better still, the assignment culminates with the sharing of essay writing in front of their classmates and their parents, providing a real audience and true learning occasion. While students engage in the Innovation Lab and use 3D printers and a laser system, they ultimately present their innovations and creations to the Lower School kindergarten classes. Throughout the design process, students are aware that their projects are meant for a real audience which guides their design and building choices. Our Middle School students have an opportunity to share their creative works—whether a poem, a short story, a visual arts creation, or a song. 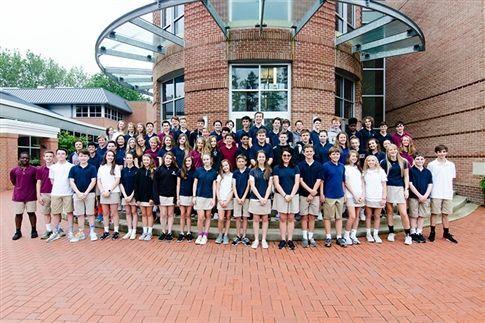 The Middle School literary magazine, The Admirals' Pen, sponsors two coffeehouses a year in the fall and spring. This experience gives students an authentic audience for their creative enterprises. In the true spirit of a coffeehouse, real coffee is served in a casual atmosphere. In the spring, the coffeehouse event is held in the Stine Environmental Center’s outdoor theater. It’s a wonderful setting that attracts a large audience, inspired by our students’ shared creative work.